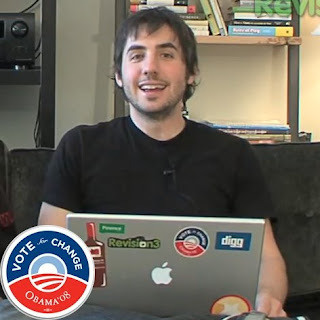 In the latest Diggnation (#160) Kevin Rose is sporting a new Obama sticker on his MacBook Pro. He has added a few new stickers in the past few weeks, including Pownce, Revision3, & Digg. OK, so it actually first showed up in episode 159. I guess I was distracted by all the crap in Martin Sargent's shed.